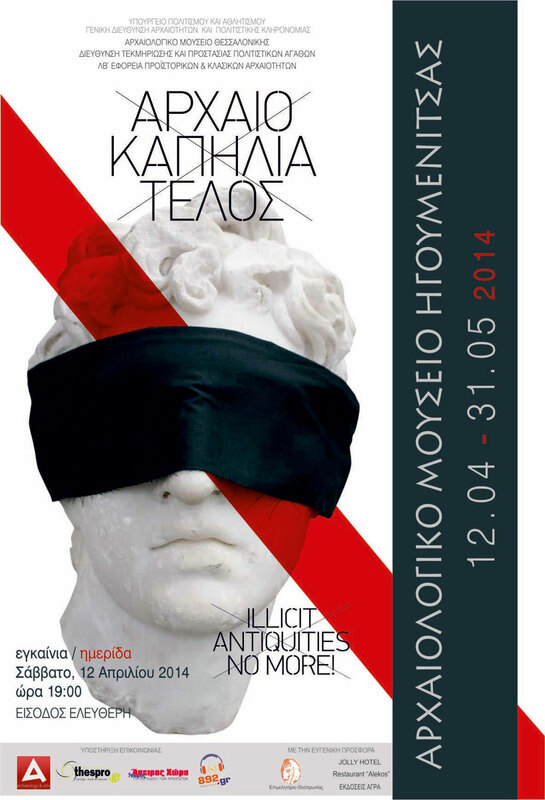 Launching on April 12th and until May 31st 2014, the temporary exhibition “Illicit Antiquities No More” will be hosted at the Archaeological Museum of Igoumenitsa under the auspices of the 32nd Ephorate of Prehistoric and Classical Antiquities. The exhibition of informative material entitled “Illicit Antiquities No More” was organized by the Archaeological Museum of Thessaloniki in cooperation with the Directorate for Documentation and Protection of Cultural Goods of the Hellenic Ministry of Culture & Sports. Being an adaptation of the informative material included in the important homonymous exhibition of the Archaeological Museum of Thessaloniki (April 2012 – June 2013), it was first presented on the occasion of the 3rd International Conference of Experts on the Return of Cultural Property (Athens – Ancient Olympia, 23-26 October 2013). The exhibition units aim at showing the various dimensions and implications of the illicit excavations and trafficking of antiquities, making it understood that the protection of cultural heritage is everyone’s duty and that it concerns us all. During the hosting of the exhibition at the Archaeological Museum of Igoumenitsa additional archaeological and informative material will be presented, regarding four recent cases of looting and illicit trafficking that took place in the area of Thesprotia. It has also been included a photo gallery and the chronicle of the so-called “Paramythia hoard”, an impressive group of ancient bronze statuettes and reliefs, found at the end of the 18th century in the area of Fotiki and which, after a series of transactions, ended up in collections of foreign museums and in the possession of unknown collectors. The opening of the exhibition will take place on Saturday, April 12th 2014, at 19.00, followed by speeches on the various aspects of illicit trafficking and the framework for the protection of antiquities by representatives of the: Archaeological Museum of Igoumenitsa (George Riginos, Antonia Tzortzatou, Theodora Lazou), Archaeological Museum of Thessaloniki (Eleftheria Akrivopoulou, Ourania Palli, Giorgos Tsekmes, Maria Loukma), Directorate for Documentation and Protection of Cultural Goods of the Hellenic Ministry of Culture & Sports (Christos Koutsothanasis, Konstantinos Nikolentzos), 2nd Ephorate of Prehistoric & Classical Antiquities (Athina Chatzidimitriou ), 8th Ephorate of Byzantine Antiquities (Varvara Papadopoulou). During the hosting of the exhibition, the Archaeological Museum of Igoumenitsa will be running the educational program “A treasure of gold”, addressed to organized school groups (D-F Elementary School Classes). The educational program aims at informing and sensitizing children on the dangers of illicit trafficking and the protection of our cultural heritage. It is an adaptation of the relevant unit of the Educational Folder “Witness the Past: Education Program on Illicit Trafficking of Antiquities”, produced by the Technological Educational Institution (TEI) of Athens. The presentation of the exhibition “Illicit Antiquities No More” at the Archaeological Museum of Igoumenitsa is organized in collaboration with the Archaeological Museum of Thessaloniki and the Directorate for Documentation and Protection of Cultural Goods and with the courteous contribution by the Chamber of Thesprotia, Jolly Hotel, Restaurant “Alekos” and AGRA Publications. Communication support is offered by archaeology & arts, thespro.gr, Apiros Hora and Radio Igoumenitsa 89.2 FM. The exhibition will be open during the working hours of the Archaeological Museum of Igoumenitsa, with free admission.